This color was named after a French liqueur of this fascinating color called green Chartreuse. This liquor came on the market in 1764. I fell in love with this crazy color “chartreuse” that is halfway between yellow and green when I was a child. My mom had knitted me a straight dress in this color. I loved to style that dress with a brown wide belt with a huge silver buckle, brown shoes and ivory tights. As one can see, I am still in love with it. 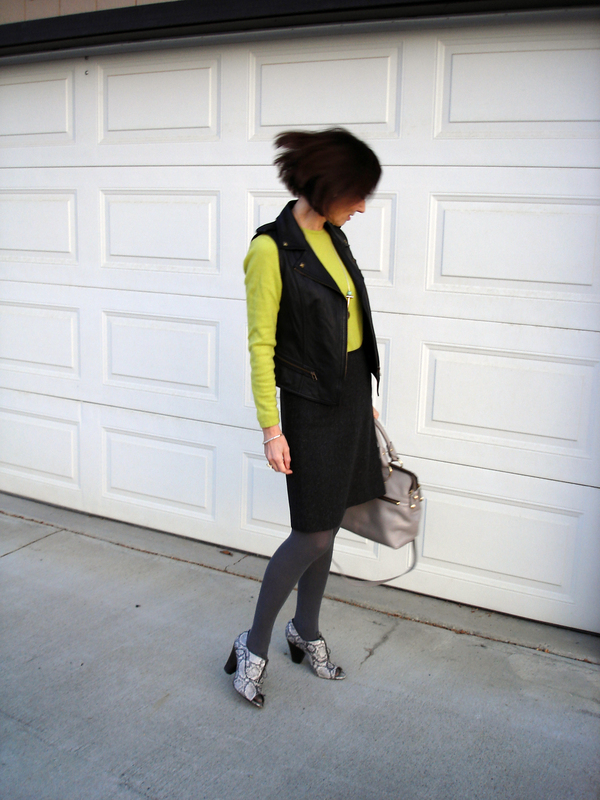 Here I am wearing my chartreuse cashmere sweater under a black leather motorcycle vest with a gray tweed wool skirt, gray tights and my open-toe fall booties with snake pattern. The trick to wear open-toe booties still at temperatures around the freezing point is to wear half socks underneath the tights. Of course, one also has to watch the forecast that there will be no rain in the mix, and one should not wear them on a day when one will be outside for a longer time than just hurrying through a parking lot or from the bus stop to the office or home. It is already winter in Fairbanks with temperatures below the freezing point. When temperature will be a couple of degrees lower, I will have to store my burnt red leather coat for next spring that I added here for the commute to work. 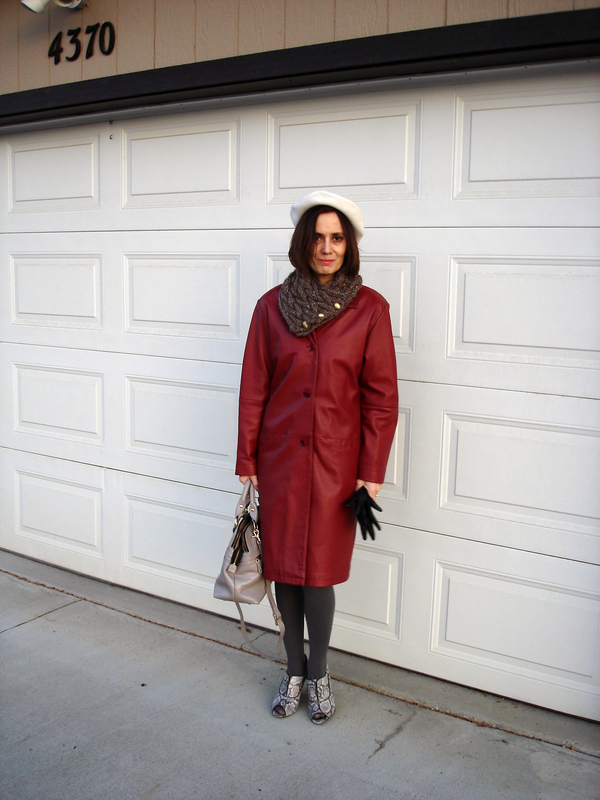 I wore it with a ivory beret, black gloves, and cable knit wool scarf. The scarf was knitted by a dear dance friend of mine who made it for me as a “good-bye” gift when she moved away.